The Cairns Post in September published the following list of participants to the Great Barrier Reef Foundation Hamilton Island Junket conducted last May around the time of their $444 million windfall. 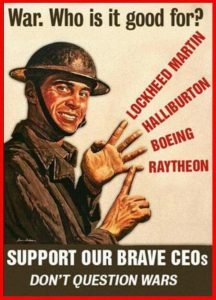 It’s wasn’t only the Finance and Fossil Fuels folk but the Merchants of Death were present too: Boeing, Aecom and GE. Climate and Militarism – two sides of the same coin – rooted in extractivism. It’s a speed dating weekend, where relationships are made and deals done. In the topic of your choice. While pretending its about “Save the Reef”. Was that Captain America where the evil ones were the good ones were the evil ones??? Or Austin Powers?? Only the scientists present would have been confused enough to think it was about science. One, who wasn’t there, can be heard on the ABC Hamish Macdonald soon after convinced that the BRF was committed to great science – their projects were all, at last, being funded.